We work hard every day to earn your trust, and a referral from you to a friend, colleague, relative, or neighbor is the greatest compliment we can receive. Referring us to your friends means you’re helping them too. We will compare insurance prices and look for potential coverage gaps to ensure they’re receiving the best protection at the lowest possible price! 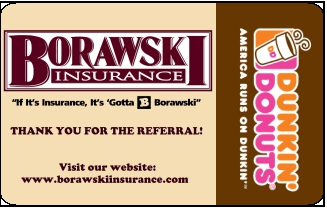 In appreciation of you recommending our services, every time you refer someone to Borawski Insurance we will send you a $5 Dunkin Donuts gift card, even if the person you referred to us does not become our client! Just tell them to mention your name when they call to receive your gift card, and don’t worry, we also ask every client where they heard our name as well! For more information please contact us via email info@borawskiinsurance.com or call 413-586-5011.